North Korean leader Kim Jong Un supervised the test of the Pukguksong-2, which confirmed reliable late-stage guidance of the warhead and the functioning of a solid-fuel engine. 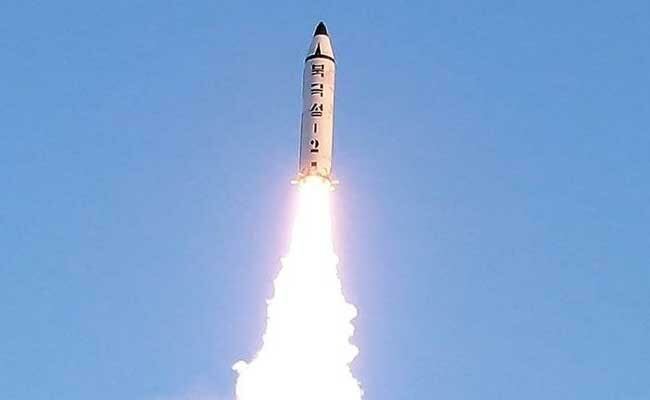 A view of the test-fire of Pukguksong-2 guided by North Korean leader Kim Jong-Un. Seoul: North Korea said on Monday it had successfully tested an intermediate-range ballistic missile which met all technical requirements and could now be mass-produced, indicating advances in its ambitions to be able to hit the United States. The North fired the missile into waters off its east coast on Sunday, its second missile test in a week, which South Korea said dashed the hopes of the South's new liberal government under President Moon Jae-in for peace between the neighbours. Pyongyang has defied all calls to rein in its nuclear and missile programmes, even from China, its lone major ally, saying the weapons are needed for defence against U.S. aggression. The South's military said the test provided more "meaningful data" for the North's missile programme but whether the North mastered the re-entry technology for the warhead needs additional analysis. "For military purposes, solid-fuelled missiles have the advantage that they have the fuel loaded in them and can be launched quickly after they are moved to a launch site," David Wright, co-director of the Global Security Program at the U.S.-based Union of Concerned Scientists, said in a blog post.